Where To Start When Redoing your Kitchen Cabinets | S.J. Neathawk Lumber Co. Kitchen remodels are always interesting as they encompass so many moving parts and different materials. Kitchens themselves are unique in that it’s the one place in your home where the spaces tend to become as old as the appliances within it over time. It’s easy to tell the difference between a new kitchen and an old one. The walls, countertops, and especially cabinets all tend to stick out. 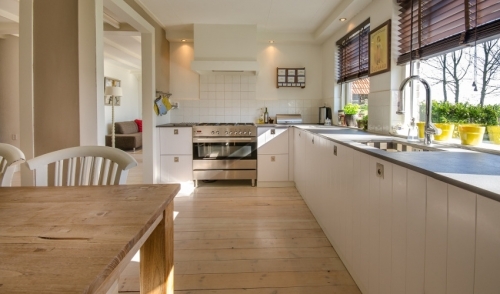 Kitchen cabinets are just as important as floors when it comes to kitchen remodels. The good news is that you don’t have to spend a ton of money to make your kitchen look like a million bucks. If you don’t know where to start when redoing your cabinets, then this is article is for you. Before redoing your kitchen cabinets take a hard look at them. In fact don’t just look, analyze every detail from the knobs to the hinges on the doors. This analysis will give you confidence going forward because you will develop an understanding of how far you really need to go to achieve results. The concept of remodeling doesn’t always mean starting completely from scratch. It’s not always going to require demolition and professional contractors. Many kitchen cabinets don’t need to be totally removed and redone. If your kitchen cabinetry still has great foundation but just looks worn-out, simple applications such as paint and removing the doors can give your kitchen a fresh new look. This combination is commonly practiced by many owners as it’s easy to DIY, and the most cost effective. Other affordable fixes include replacement of knobs and pulls, adding crown molding, extra storage, and replacing doors. Replacing the doors or refacing your cabinets cost about 20% of what it would normally cost to replace the cabinets altogether. Doors come in a variety of options and styles that can offer a new style to your kitchen. If you have thoroughly reviewed your kitchen and feel that a total refresh is required, then start doing your research at local hardware stores and showrooms. I recommend getting a few quotes from reputable contractors or craftsmen regarding the job you want done. It will require professional installation to set up brand new cabinetry in your home. It will also mean you won’t have access to kitchen for a while so make plans to meal prep at a friend’s place or explore all the local eateries in your neighborhood. Gather as much info as possible from experts and begin to plan the design of the new cabinets. Skip out on custom configurations as they tend to be expensive and not worth the money to fill awkward spaces. Consider different shelves and storage options within the cabinets such as rollout trays or drawers and pull-out shelves for blind corners. Good cabinetry design starts with making storage and efficient use of space a priority. Make both sense and cents out of redoing your kitchen cabinets. Whether you’re starting over or making a small change, both can have a big impact on the appearance of your kitchen. Now that you know where start, take the next step and begin the process!